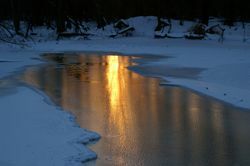 "Fire and Ice," Photo copyright 2010 by Julie Falk. The January “Thaw” was much needed for both the fish population and the anglers themselves. It’s always nice having a little reprieve from the arctic winter to not only make fishing comfortable, but to let us know that spring steelhead season really isn’t that far away. It’s also nice to have a little trigger of water enter the watershed to entice a few fish into the river and redistribute some of the fish already in the system. The Big Manistee River with its stable flows and deeper runs is as good of a bet as any river right now. Look for fish in the slower, deeper water with a mix of trout and both fresh and holdover winter steelhead. Hint: you will find fish in the same water that you find early king’s staging in. The Betsie River, too, has given up some fish lately, but like the Big M. – look for the deeper holes and pockets to be your best bet. Temperature is clutch in winter Steelheading and as such, look for late morning and early afternoons to be a little better with the minimal bump or at least stabilization of water temps. Solar activity (yes, there is such thing as sunshine in Northern Michigan this time of year) can be just enough to produce a bite, but with sun and clear water it is even more crucial to use your best drift, lighter tippet, and a bit of stealth.